The Society enjoyed the historic surroundings of the House of Lords on Monday, July 17, thanks to an invitation from our new Vice President. Baroness Anne McIntosh of Pickering led a star-studded evening where we introduced guests to our and our mission to provide support, raise awareness and help fund research into encephalitis. 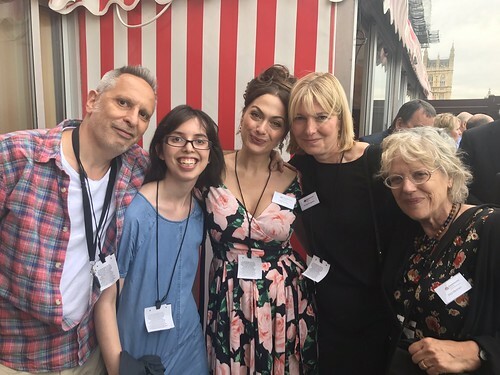 Joining Anne, who is a member of the House of Lords, were actresses Jemma Redgrave and Kika Markham, who is also a Vice President, ambassadors Tonia Buxton and Simon Hattenstone, our local MP Kevin Hollinrake, Lord Roy Kennedy of Southwark and Lord Alex Carlile of Beriew, among others. It was also brilliant to be joined by so many representatives from our corporate partners. The evening was designed to introduce the uninitiated to encephalitis and the work of the Encephalitis Society, be they from the House of Lords or friends of our corporate supporters, ambassadors or other acquaintances. Dr Ava Easton, the Chief Executive of the Encephalitis Society, said: "Events such as this and the fruit that they bare are an important step in our long-term objectives to make encephalitis as well-known as Motor Neurone Disease and bacterial meningitis among British households. "We are very grateful to Baroness McIntosh for her hospitality and the first-class support she has already shown to the Society since she agreed to become our vice president." The Society will return to the Houses of Parliament later in the year when MP Kevin Hollinrake hosts the charity in the House of Commons at an event to launch next year's World Encephalitis Day campaign.